The other day found us going to a restaurant that I have often gone to with my dinner club, but as of that day, my Bride and I had not gone to together. It is amazing that some how we always seem to frequent the same haunts or to try someplace special, and one seems to forget about other places. Of course to be truthful we were still not going there for dinner, but to celebrate a Priest’s 35’Th Anniversary. I was going to start this article by using the term “man of the cloth,” but when I went to research this term, I discovered that I had been using it the wrong way for a Priest in the Roman Catholic Church. In the pecking order of the Roman Catholic Church, that expression is used for a lector or reader, an individual that is ordained in a minor order of the church, or it can be used for a postulator, an individual that proffers a potential candidate for beatification; see what one can learn researching for a Wine Blog. When we got to the restaurant, both of the parking lots were crammed with automobiles, so I dropped off my Bride and one of her friends from her church, and I went in search of a parking spot. It turns out the restaurant was closed that afternoon and was only open for the affair that we were attending and a couple of showers as well. I finally found or should I say, I created a parking space along the edge of the woods, and went in through the back door. I was amazed at the crowds of people that were there to celebrate this anniversary and it was a testament to his service. When I saw the organized chaos of such an affair, I immediately thought to find a table for us to sit at, and I walked into the tavern part of the complex and asked if I could take a table there and perchance buy a bottle of wine, instead of having some of the wine being poured by the house. Of course they encouraged me, and the restaurant has a nice selection of wines to choose from, without the idea of gouging their patrons. After I purchased the bottle of wine and they brought me some wine glasses and a marble icer, I placed my hat and umbrella in such a manner that it denoted that the table was being reserved and I went to find my Bride and her friend, and to bring a glass of wine for my Bride as well. I had to pass the receiving line, but since I was traveling the other way, it was a bit quicker for me to maneuver and I walked past one set of tables set up with food for the people there, and I also later found out that they had another station set up in a room that I was not even aware of with more food. As I walked in the opposite direction of the line for all the well wishers, as it snaked around the halls and passageways I finally found my Bride and her friend and I gave her a glass of wine, and asked her friend if she would like a glass as well, which she declined. I told my Bride that I had bought a bottle of wine, and she had deduced the fact, since we had crystal wine glasses and the other people were drinking wine from plastic glasses. When I saw how far back they were in the line, I told her that I was going back to the bar, to protect our table and I would join them as they got closer to the man of the moment. As I kept checking on her progress, I eventually joined the ladies to congratulate the Priest, and I look at the cache of wine bags that he had in the corner behind him, because he is known to appreciate a glass of wine and every Christmas we always gave him a bottle of wine for the holidays. After we had gone and paid our respects, I showed the ladies where we were seated and they went to get some plates of food. They came back with plates laden with an assortment of different dishes including a couple of pastas. The pasta with an “Alfredo” sauce was very unique and very spicy, I could have gone for just another plate of it, but I thought that it might be in poor form, on my part. After I had “reserved” my table in the tavern, I was trying to get a copy of the wine carte from bartender, I noticed a waitress carrying two open bottles of wine. I asked if that was the wine that they were serving for the anniversary group and she said yes, so I bothered her for a moment to take a picture of one of the bottles. 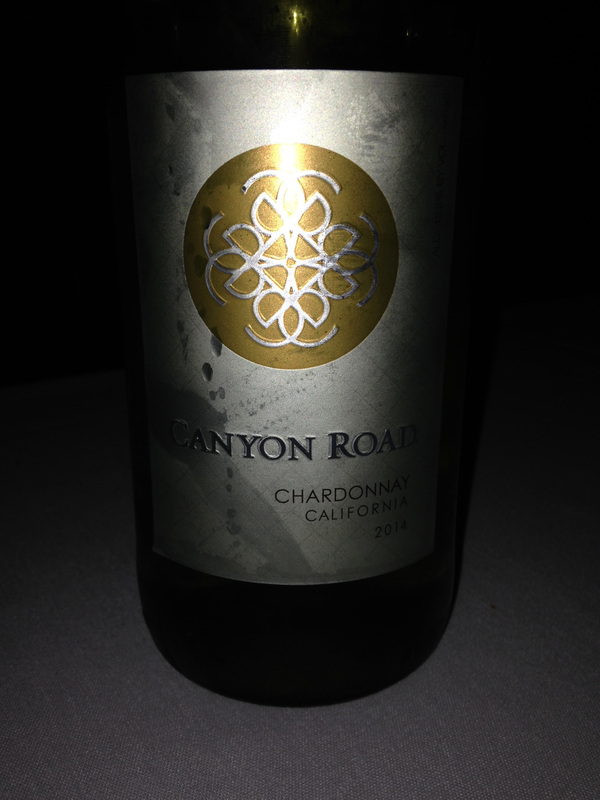 The wine was a bottle of Canyon Road Chardonnay 2014 from Canyon Road Winery, and the other bottle was also from them, but their Cabernet Sauvignon. Canyon Road wines are popular priced and they have a California designation, because the fruit is sourced from across the state, and they produce this wine in huge productions. For a large group as we were at, this is a fine wine to serve, and they do it well. 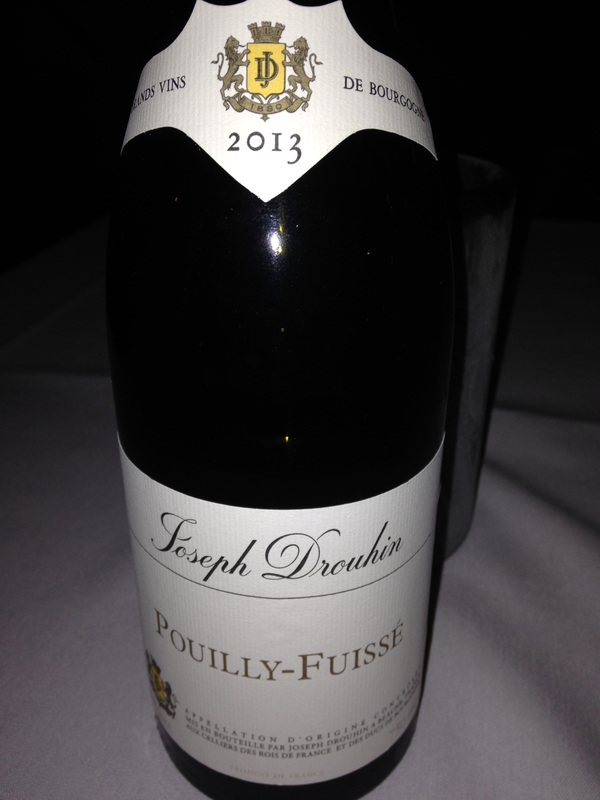 I, on the other hand had selected a Chardonnay, but of much smaller production, but it was a Negociant wine; a bottle of Joseph Drouhin Pouilly-Fuisse 2013. This is a white wine from the Maconnais and it was very refreshing and was just what a softer white Burgundy wine should taste like. There are no Premier Cru wines from the Communes of Maconnais, so one should look for a good blender or house and Joseph Drouhin has a long history in the Beaune. By the time we finished the food and the wine, the affair was coming to an end, so it was perfect timing. This entry was posted in Dining, Wine and tagged California, Canyon Road, Canyon Road Winery, Chardonnay, France, Joseph Drouhin, Maconnaise, Pouilly-Fuisse. Bookmark the permalink.